You absolutely have the best avatar of the single best character from any show ever but you need a higher quality image. He's penalized for being good? Doesn't make much sense. With that logic, if you won 100% of all matches, you would have the easiest draws of all time. yeah after beating such hard people then facing zverev in finals.. it would be so relaxing. if you could beat everyone else then zverev will be no problem. How was Zverev? Did he dummy throw at all? For an ATP 500 event, Kyrgios' draw was one of the hardest, if not the hardest in recent times. But on topic, I would have to agree this is one of the hardest draws of all time. Tsonga's 2014 rogers cup win takes the cake though. I'd say Novak's run at the 2007 Montreal is 2nd. How is Djoko's USO 2011 tougher than Fed's AO 2017? IIRC Davey went downhill after 2010, that leaves only the SF and F as 'tough', compared to Fed's four. Won't argue Rome 2011 and Montreal 2007 though, they're legit up there in terms of tough draws. 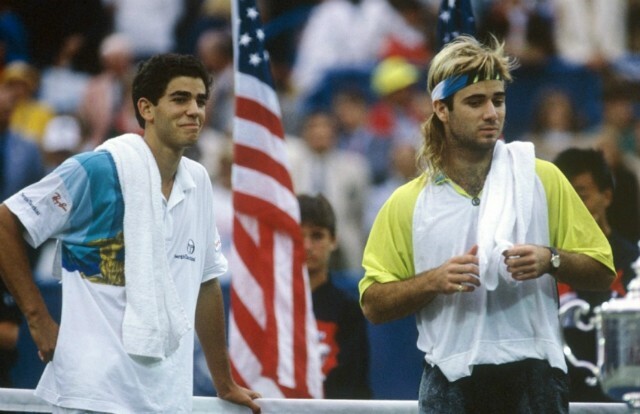 F _ Agassi (6/4 6/3 6/2)! Tsitsipas didn't win it, but his 2018 RC draw was unbelievable hard. Yes, that was an amazing run. I remember it vividly. Except Zed is usually invincible outside of the four grand slams. Can't help but laugh at the fact that Kyrgios' first round opponent, who was by far the weakest opponent he faced, was the toughest opponent that Aussie tennis trailblazer De Minaur faced in his tournament victory early this year. Not just the toughest, but the only player of consequence. Let's see if the Australian media greets this with the same rabid enthusiasm they did with Alex's weak 250 victory. MAN you hate the Australian msm even more than me LOL! I just think that they're either utterly misinformed or willfully ignorant about what tennis talent looks like. Every time I see an article about how impressive Alex De Minaur is just because he scrambled around and his opponent missed an easy shot I throw up in my mouth a bit. It hurts my knees and hips watching him do all that. Hewitt retired early(ish) with that hame style. Murray had to have a hip replacement. Like buying stuff on credit, you pay triple for it eventually. Place Kyrgios in the US Open quarter-finals of 1980, and ask him to beat Lendl, Connors and Borg in successive 5-set matches. That's what McEnroe did that year. One racket smash and a show of annoyance at an early drop shot winner by Nick which interrupted a lovely baseline exchange. Well better than Montréal 2007 there is Madrid 2007, as Djoko is thougher than Nalbandian: Clement, Berdych, Nadal, Djokovic, Federer. But the toughest has to be WTF 2010: n7 Ferrer, n5 Murray, n4 Soderling, n3 Djokovic, n1 Nadal. Well at least it's as though as can be for Federer. I have to say that is a damn hard draw for a 500. I assume WTF doesn't count here for whatever reason? Because I imagine there are many WTF victories that have involved tougher fields over the years. Overall, I could think of about 10 fields Djokovic has faced over the years that are as tough/tougher than this. It was a tough draw and I'm surprised and impressed that he came through it. But it really isn't close to the toughest draw ever. Seppi has never been a top quality player. Wawrinka had done nothing of note for 18 months. Isner is ok but again hasn't done a lot recently. Nadal and Zverev were the toughest opponents. Zverev is quite hit and miss. . Still a good win. Nadal was also a good win but again, he's a little hit and miss and scoring a win at Acupulco over him isn't the same as beating him at Monte Carlo. A quality draw and an impressive run. But let's not make it out to be something it's not. WTF is a really weird event. Every match has huge potential and yet we regularly see blowouts matches. Shows how much "feeling good" matters in tennis. Didn't realize you felt so strongly about Colonel Mustang. But then again, he's such a badass. Djokovic USO 2011: against Federer and Nadal. Nadal RG 2007: against Djokovic and Federer. Federer AO 2017: against Nadal only, Djokovic not found. I would say Nick's draw was the hardest I remember for a Masters 500: Nadal, Wawrinka, Isner and Zverev. Please someone correct me if I am mistaken, but right now I can't think of a harder draw in a Masters 500.